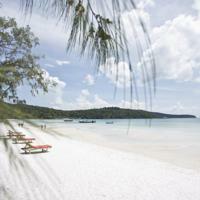 Sol Beach Resort offers Khmer-style beachfront accommodation on Saracen Bay in Koh Rong Sanloem. Guests can enjoy meals in the resort’s open-air restaurant available on site. The resort’s villas offers views of the sea. Some units feature a seating area for your convenience. Some rooms include views of garden. Every room at this resort is air conditioned and features a private or shared bathroom equipped with hot shower facilities and a bath. 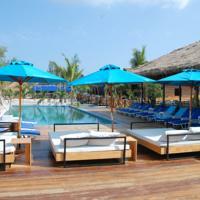 Sol Beach Resort features free WiFi throughout the property. There is luggage storage space at the property. This resort has a private beach area and car hire is available. A range of activities are offered in the area, such as snorkeling, fishing, boating and hiking at an additional surcharge. 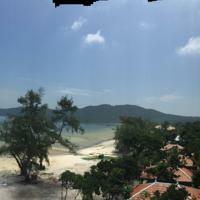 Sihanoukville is 24 km from Sol Beach Resort by ferry service, while Song Saa Private Island is 21 km from the property. The resort provides door-to-door shuttle services from Phnom Penh International Airport or other hotels at an additional cost. This service also includes ferry reservations to the resort. Offering an outdoor pool and a private beach area, The One Resort is located in Koh Rong Sanloem. The resort has a children’s playground and views of the sea, and guests can enjoy a meal at the restaurant or a drink at the bar. Some rooms include a seating area to relax in after a busy day. Rooms include a private bathroom. You will find a 24-hour front desk at the property. A number of activities are offered in the area, such as snorkeling and diving. 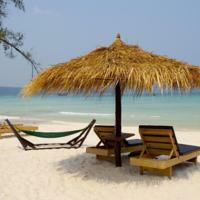 Sihanoukville is 24 km from The One Resort, while Song Saa Private Island is 21 km away. Natural Island is a relaxing getaway offering rooms with a sea view balcony. 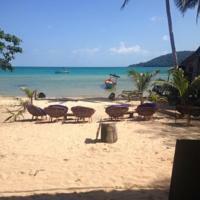 Located on Koh Rong Sanloem Island, the resort offers access to a private beach area and restaurant. 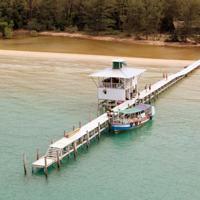 A 40-minute boat transfer takes guests from Sihanoukville Boat Station to Koh Rong Samloem Island. Daily scheduled boat transfers are chargeable and can be arranged in advanced with the resort. Sihanoukville International Airport is 37 km away. Each fan-cooled room has a seating area and outdoor dining area. A mosquito net, safe, towels and linen are provided. A currency exchange, 24-hour front desk and dry cleaning services are available at Natural Island. 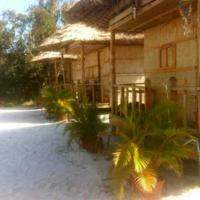 Leng Meng Beach Bungalow is located in Koh Rong Sanloem, 25 km from Sihanoukville and 21 km from Song Saa Private Island. Guests can enjoy the on-site restaurant. Some units feature a seating area for your convenience. All rooms are fitted with a private bathroom. You will find ticket service at the property. Featuring a picturesque beachfront with activities such as diving, snorkelling, and fishing, Orchid Resort is located in the heart of Saracen Bay, Koh Rong Samloem Island and offers guest bungalows directly on the beach. 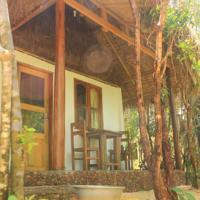 The bungalows here have fans, terrace with views, desk, and a private bathroom with a shower. Guests can enjoy a delicious selection of fresh, local and international meals at the Orchid Resort Restaurant. Popular choices include the wood fired pizza oven and daily fresh seafood barbecues. Refreshing cocktails and international wines are served at the bar. Situated along the shores of Koh Rong Samlon, Secret Paradise Resort offers tranquil and comfortable accommodation with stunning views of Saracen Bay. Guests can enjoy activities such as fishing, diving and snorkelling on site. Featuring a private entrance and terrace, fan-cooled bungalows come with tiled/wooden flooring, a mosquito net, freshly-laundered bedding and sofa seating area. The attached bathroom includes towels and shower facility. At Secret Paradise Resort, guests may spend the day sunbathing on the white sandy beach or swimming in the clear sea waters. Fluently-conversed in English and Polish, the friendly staff can assist with luggage storage, laundry and ticketing services. The in-house restaurant serves a tasty selection of Asian and Western dishes, along with tasty coffee and fresh fruit shakes. Guests can enjoy meals in the comfort of their bungalow’s verandah, or arrange for a private romantic dinner on the beach. 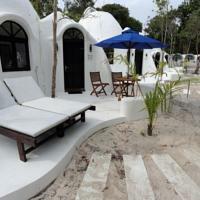 Moonlight Resort is an eco-friendly beachfront property in Saracen Bay, Sihanoukville. It is 24 km from the Cambodian mainland. It hours a 24-hour front desk and free WiFi. The hotel features an in-house restaurant serving up Asian and Western food and beverages. It is approximately 30 minutes by car from Sihanoukville International Airport to the ferry pier. Two options (the resort’s slow boat and fast boat) are available to reach the island within specific timings at an additional cost and includes some refreshments. All domed bungalows come equipped with fans and feature a king bed under a skylight. En suite bathrooms are attached with a shower. Rooms offer either a sea or a beach view with a private balcony. A range of activities are offered in the area, such as snorkeling, diving and fishing as well as other water sports options. The property is 17 km away from Koh Rong Island. 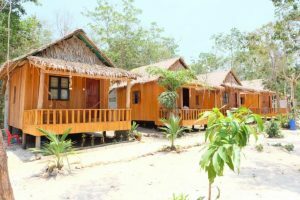 Saracen Bay Resort offers a relaxing getaway in rustic wooden bungalows located on the beach of Koh Rong Samloem Island in Sihanoukville. Offering a private beach area and refreshing fruit juices, the resort also provides boat transfers from the mainland to the island. It takes 30 minutes by car from Sihanoukville International Airport to the boat station and another 2-hour boat ride from the boat station to the island. 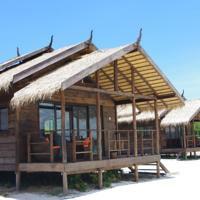 Resort Saracen Bay provides standalone bungalows with private terraces along the beach. They are spacious and feature modern bathroom facilities. Views of the ocean can be enjoyed from the bungalows. The in-house restaurant offers a selection of Asian and Western food, refreshing cocktails and other beverages. There is a small local market within walking distance of the resort. Situated along the shores of Saracen Bay, Sweet Dreams Samloem offers tranquil and comfortable accommodation with daily housekeeping service. Operating a 24-hour front desk, it features a restaurant and private beach area. Simply furnished, rooms and bungalows come with a clothes rack, mosquito net and freshly-laundered bedding. Guests have access to either a shared or private bathroom with shower facility. Fluently-conversed in Russian and English, friendly staff at Sweet Dreams Samloem can assist guests with ticketing service and airport transfers. Activities such as snorkelling, diving and canoeing can also be arranged. This beachfront property is approximately 36 km from Sihanoukville International Airport. Nestled along Saracen Bay in Koh Rong Sanloen, GreenBlue Beach Bungalow Resort offers peaceful and comfy accommodation with views of the sea from private balconies. Recently refurbished beach bungalows boasts a secluded beach area and the property houses a restaurant on site. 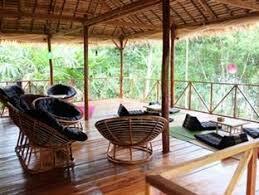 Offering a choice of square or round bungalows made from natural materials, the fan-cooled rooms come with wooden flooring, a clothes rack, mosquito net, a personal safe and seating area. Square bungalows feature an upper balcony deck that opens up to jungle and ocean views, where nature is merely steps away. En suite bathrooms are fitted with an open sky shower and include free toiletries. At GreenBlue Beach Bungalow Resort, guests can enjoy activities such as fishing, canoeing, diving and snorkelling. Massage and transport services can also be arranged upon request at additional charges. The in-house restaurant overlooks the beach and serves up a selection of cuisines ranging from Turkish to authentic Khmer and Western delights. 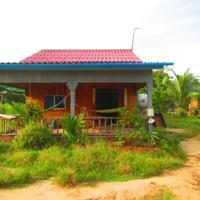 The property is 37 km from Sihanoukville International Airport. Located on the shores of Saracen Bay, Sun Island Eco Village offers comfortable tent accommodation equipped with 24-hour electricity powered by solar energy. Boasting a private beach area, guests can enjoy activities such as fishing, diving and snorkelling on site. The property is within a 90-minute boat ride from Ochheuteal Beach. Guests arriving at Sihanoukville International Airport can take a 30-minute drive to the boat station, where a 2-hour boat ride will bring guests to Koh Rong Samloem Island. Featuring a thatched grass roof, the tent includes a mosquito net, desk and sofa seating area. Each tent comes with a private bathroom equipped with shower facility and free toiletries. Guests also enjoy views of the sea and mountain from their tents. 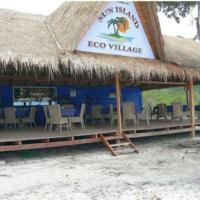 At Sun Island Eco Village, the 24-hour front desk staff can assist guests with luggage storage and laundry services. Ticketing and sightseeing arrangements can be made at the tour desk, while massage services are available on request. Surrounded by tropical greenery, the property houses a restaurant serving Asian and Western dishes, along with seafood specialties. Cocktails, fresh juices and beverages are offered at the bar. 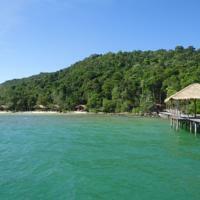 The Drift is located in Koh Rong Sanloem, 26 km from Sihanoukville. Guests can enjoy the on-site restaurant. Each room is fitted with a shared bathroom. There is luggage storage space at the property. Guests can enjoy various activities in the surroundings, including snorkeling and diving. Song Saa Private Island is 15 km from The Drift, while Koh Rong Island is 11 km away. Offering a barbecue and a private beach area, Happa Garden Resort is situated in Koh Rong Sanloem in the Preah Sihanouk Province Region, 26 km from Sihanoukville. Guests can enjoy the on-site restaurant. The property also offers free luggage storage at Sihanoukville. You will find room service at the property. An array of activities are offered in the area, such as snorkeling and diving. Song Saa Private Island is 20 km from Happa Garden Resort, while Koh Rong Island is 16 km away. 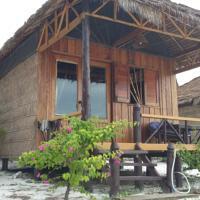 Robinson Bungalows is located in Koh Rong Sanloem. It enjoys a stretch of private beach area along Sunset Beach, where water activities can be arranged. Fitted with a terrace offering sea views, each rustic bungalow comes with a mosquito net and a private bathroom with shower facilities. Guests can have meals at the restaurant, or catch some sun at the sun deck. The property is about 23 km from Independence and Victory beaches. Sihanoukville International Airport is 37 km away. Paradise Villas Cambodia is a beautiful beachfront property located in Koh Rong Sanloem. It offers charming Cambodian-style villas fitted with a private terrace. You will also find a private beach area. Villas are spacious and cooled with a fan. Each villa has an outdoor seating area, a clean en suite bathroom with free toiletries and a mosquito net. Villas offer direct access to the beach. Paradise Villas Cambodia houses a peaceful a garden where you can relax with a drink in hand. Other facilities include bicycle rentals and currency exchange services. Staff at the front-desk can also arrange for water-sport activities including canoeing, snorkeling and diving. Enjoy a cold beer at the bar or sample authentic Khmer-style cuisines. Barbeque facilities and room service are available. The accommodation is located 34 km away from Sihanoukville International Airport. Situated on Koh Rong Samloem Island off the coast of Sihanoukville, Freedom Island Bungalow features a natural freshwater pool, a restaurant and bungalows with a balcony located right on the beach. Koh Rong Sanloem Island is accessible via a 2-hour boat transfer from Sihanoukville boat station, which is a 30-minute drive from Sihanoukville International Airport. Boasting sea views, each fan-cooled bungalow has a mosquito net and coffee table. The private bathroom includes a shower and free toiletries. Guests can go on a fishing, hiking or diving trip, or charter a boat to explore the island’s surroundings. Boat transfers are scheduled and chargeable. Western and Asian dishes are served at the on-site restaurant and bar. 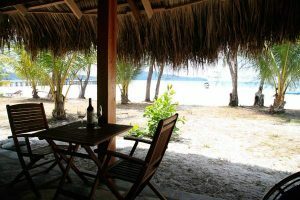 Located in Koh Rong Sanloem, 26 km from Sihanoukville, Easy Tiger Bungalows features a sun terrace and views of the sea. Guests can enjoy the on-site restaurant. Some units include a seating area to relax in after a busy day. You will find room service, gift shop, and shops at the property. Guests can enjoy various activities in the surroundings, including snorkeling and diving. 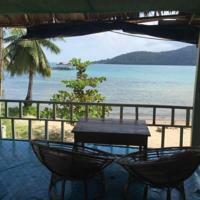 Song Saa Private Island is 15 km from Easy Tiger Bungalows, while Koh Rong Island is 11 km from the property. 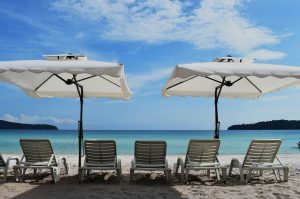 Offering a barbecue and a private beach area, Dolphin Bay Resort is situated in Koh Rong Sanloem in the Preah Sihanouk Province Region, 23 km from Sihanoukville. Song Saa Private Island is 21 km from the property. There is a private bathroom with free toiletries in each unit. Towels are offered. Guests can enjoy the on-site restaurant, with special diet menus and grocery delivery available on request. The property also offers packed lunches. 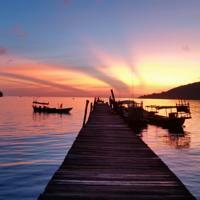 Koh Rong Island is 18 km from Dolphin Bay Resort. 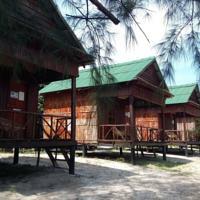 Koh Rong Samloem Villas offers a rustic experience with wooden bungalows and dormitory rooms. Located on a private beach area at Eco Sea Bay, the property can arrange diving and snorkelling trips. Eco Sea Bay is on the northern shore of Koh Rong Samloem Island, which is known for its coral reefs and is 22 km south-west of Sihanoukville. Koh Rong Samloem Villas is accessible only via a pre-booked, scheduled boat transfer, which departs from Serendipity Beach Road. 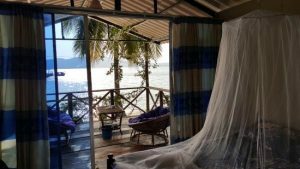 Overlooking the beach and sea, bungalows feature wooden flooring, thatched straw roof and are furnished with a fan, mosquito net and terrace with seating area. Bungalows come with a private toilet and bathroom offering a cold shower. Diving and snorkelling trips can be arranged by contact the staff at EcoSea Dive Centre located at the villas’ private jetty. Diving courses and boat rentals are also available. The in-house restaurant serves both Western and Khmer-style dishes and also offers buffet meals. 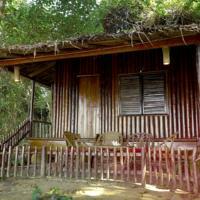 Harmony Bungalow is a collection of rustic rooms with a private bathroom on Koh Rong Sanloem Island. Featuring its own restaurant and bar, this property also has a 24-hour front desk. 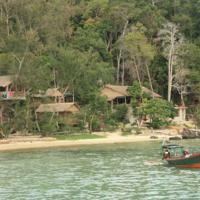 Harmony Bungalow is accessible via a 40-minute boat transfer from Sihanoukville Boat Station to Koh Rong Samloem Island. Sihanoukville International Airport is 37 km away. Every room has a clothes rack and private bathroom with toilet. Towels are provided. There is access to a sun terrace and guests can go fishing during their stay. Breakfast can be served in the rooms. 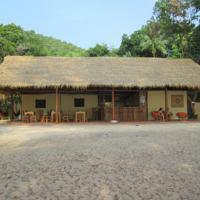 Offering a barbecue and terrace, Longvek Hostel is situated in Koh Rong Sanloem in the Preah Sihanouk Province Region. The rooms have a flat-screen TV with satellite channels. Certain units feature views of the mountains or garden. Every room is fitted with a shared bathroom fitted with a bidet and shower. Longvek Hostel features free WiFi throughout the property. A TV is provided. You will find a 24-hour front desk at the property. An array of activities are offered in the area, such as snorkeling, fishing and hiking. Sihanoukville is 26 km from Longvek Hostel, while Song Saa Private Island is 15 km from the property. Ferry transfers to other islands are available at an additional cost. 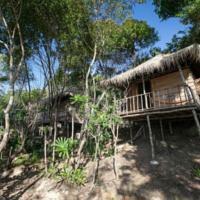 Sleeping Trees is located in Koh Rong Sanloem, 26 km from Sihanoukville. Song Saa Private Island is 20 km away. Towels and bed linen are offered. Guests can enjoy a meal at the on-site restaurant or a drink at the bar. 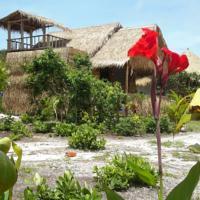 You can play billiards and darts at the property, and the area is popular for snorkeling. The area is popular for diving and hiking. Koh Rong Island is 16 km from Sleeping Trees.